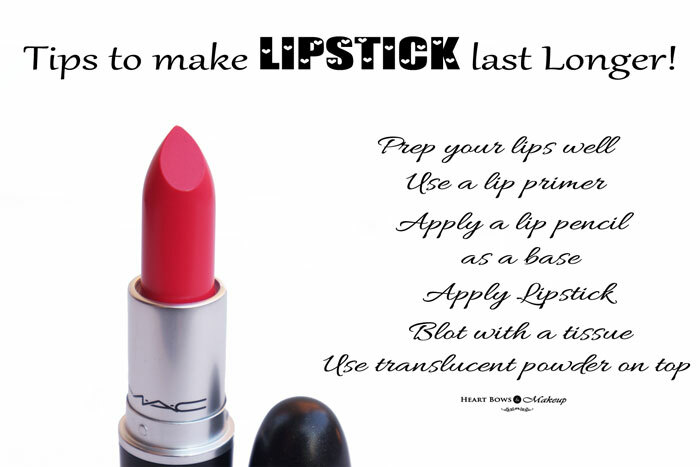 Home » Lips » How To Make Lipstick Last Longer: Tips & Tricks! 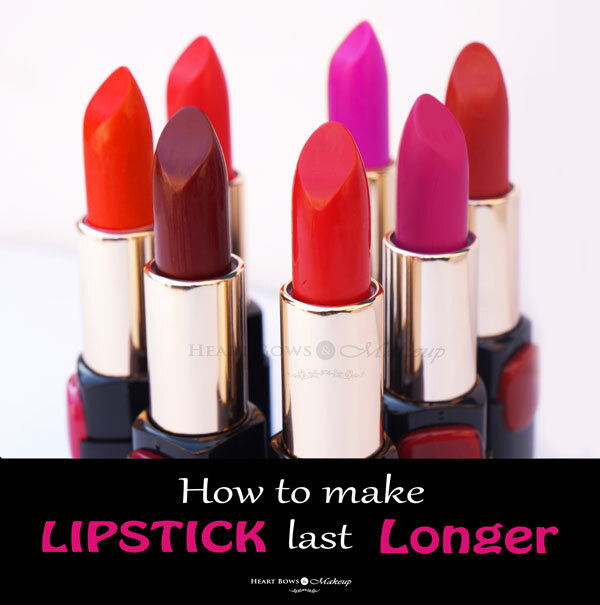 How To Make Lipstick Last Longer: Tips & Tricks! How To Make Lipstick Last Longer All Day: Best Tips & Tricks! How to make my lipstick last all day? Now, that is a question which becomes a headache for many women! 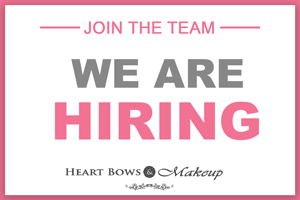 After all who doesn’t want their lipsticks to last for ever and not require a regular touch up? While it may not be possible for a lipstick to stay put forever but it is definitely possible to make a lipstick last all day, say for 8-9 hours, even after munching snacks or having meals in between! Sometimes (or may I say most of the times) it is very difficult to retouch your lips when you are travelling or attending an event and uneven lips are can completely ruin your whole appearance. So fret not ladies, Team HBM to your rescue. 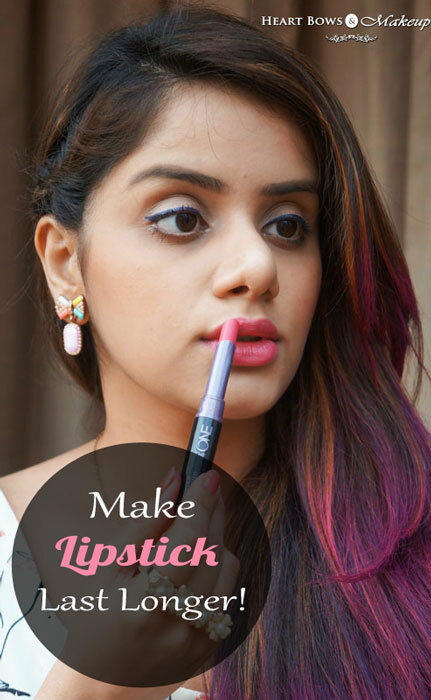 Here are the best tips on how to make your lipstick last longer on your lips! 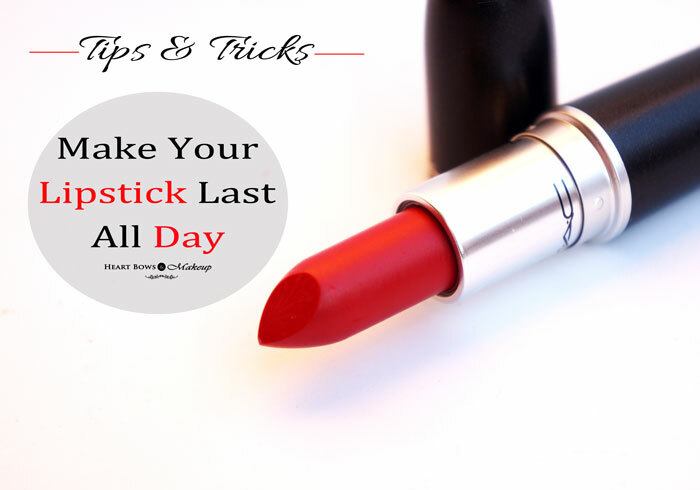 How To Make Lipstick Last Longer All Day: Step By Step Tutorial & Guide! 2) Apply a lip balm & hydrate your lips: You should use a good quality lip balm like the Maybelline Baby Lips to prevent your lips from getting dry especially after exfoliation. However, make sure you blot it before applying lipstick as the creamy texture would make the lipstick fade faster. 3) Use a lip primer or concealer (Optional): You can apply a lip primer before applying lipsticks which corrects pigmentation of the lips like the MAC Prep + Prime Lip and increases the longevity of lipsticks. Some may find it uncomfortable but some may love the effect. A foundation or a concealer can also do this job well. Apply a thin layer of concealer on your lips and then dab a tissue to remove the excess from the lips. If you have very dark lips and find difficulty in showing the proper color of the lipstick, you should definitely give this trick a try. But make sure that you apply an opaque high pigmented lipstick over it as a sheer lipstick may look muddy or pale once it is mixed with the concealer. 4) Apply a lip liner as a base: Now it is widely known that lip pencils are not just used for lining the lips. Instead they can also be used to fill in your lips, like a base for your lipstick. You should apply it concentrating on the inner rims of your lips as after meals, lipsticks tend to disappear from the inner edges. This is a great tip on how to make your lipstick last longer and even makes your lipstick look more vibrant as it covers the lip pigmentation to a good extent. The pigments of lip pencils are really long lasting hence prevent your lipcolor from looking uneven even after meals. 6) Use a tissue paper to blot: Tissue paper can be used in various ways for long lasting make up and here is how! Blot a sheet of tissue on your lips in order to remove excess oil or greasiness. Then re-apply the lipstick and blot it again. This trick is very efficient at preventing lip stains and makes the lipstick stay long all day. 7) Apply some translucent powder (Optional): Place a clean tissue on your lips and apply a little amount of translucent powder on it. This doesn’t deposit any layer on the lips but sets the color easily. After this step , if you want you can re-apply the lipstick to get the intense and fresh finish. Voila! You are ready to go.